This is a universal VIN decoder. Every car has a unique identifier code called a VIN. This number contains vital information about the car, such as its manufacturer, year of production, the plant it was produced in, type of engine, model and more. For instance, if someone wants to buy a car, it is possible to check the VIN number one the online database to ensure that the car was not stolen, damaged or illegally modified. The VIN number has a specific format that is globally recognized. This format was implemented by the ISO institute. Every car manufacturer is obliged to mark all its vehicles in this special format. This online service allows a user to check the validity of the car and get detailed information on almost any VIN number, search car parts and check the car's history. The VIN also allows a user to check the market value of a new or used car. 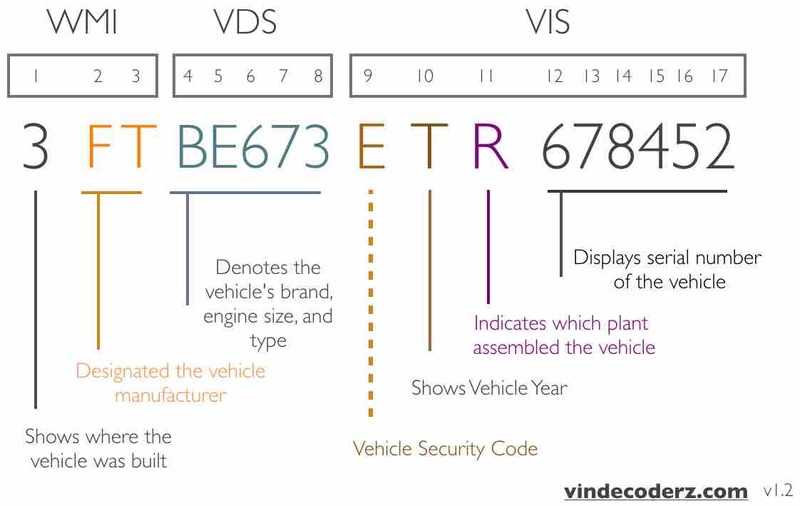 What is structure of Vehicle Identification Number? The scheme below depicts a reference vehicle ID structure. Please notice that vehicles manufactured before 1981 may have less symbols than today's ISO standard VIN consisting of 17 characters. What vehicle history report may show? A number of vehicle owners, duration of ownership, registration details, city and state of registration. Shows possible problems, ranging from salvage/reconstruction to Lemon check. Shows records related to vehicle loan/sale events including issuing financial institution. A list of accidents reported with exact dates and possible severity of damages incurred. Shows if vehicle has any pending or existed recalls. Recalls can include important safety related issues and defects that can affect vehicle operation. Needless to say, all these aspects play a significant role in consumers protection. Do not hesitate to use our lookup service. What Vehicle History Report (or VHR) does contain? Here's a list of possible features: title problems, accidents, total loss, flood damage, odometer status, dealer service records, frame damage, airbag deployment, vehicle registration, recalls and more.